A concept design for the reimagining of the Fantle Gallery at the Center for Western Studies. The new exhibits are scheduled to open in the fall of 2015. UPDATE: As of August 2015, the new exhibits are fully installed. Read about the two-year effort here, then join us Thursday, September 10, from 4-6:30 p.m. as we celebrate the opening of Voices of the Northern Plains at the Center for Western Studies. The Center for Western Studies is embarking on a major redesign of its "permanent" historical exhibit spaces to ultimately expand the themes presented to visitors of the Fantle Building. For two days in August 2013, CWS staff members Kristi Thomas, Elizabeth Thrond, and Harry Thompson met with a team of exhibit designers from Split Rock Studios to begin planning the concept design phase of the Exhibit Expansion Initiative, as approved by the CWS Board of Directors. Split Rock Studios is a nationally recognized museum exhibit firm, based in the Minneapolis area. One of its recent commissions was the redesign of the Ford’s Theatre Museum in Washington, D.C. Split Rock Studios has also completed work at the Chateau de Mores Interpretive Center in North Dakota and the Akta Lakota Museum in Chamberlain, South Dakota. The firm designed the Center’s original exhibits. The overall theme for the new exhibits will be the “voices of the Northern Plains,” referring to the voices that “speak” to us through Plains Indian and immigrant artifacts, as well as through the letters and photographs that provide context for understanding these objects. The goal of the Exhibit Expansion Initiative is to feature in new and compelling ways the remarkable treasures found in the Center’s collections. Special emphasis will be placed on sharing with the public the letters and photographs from the Center’s archives. 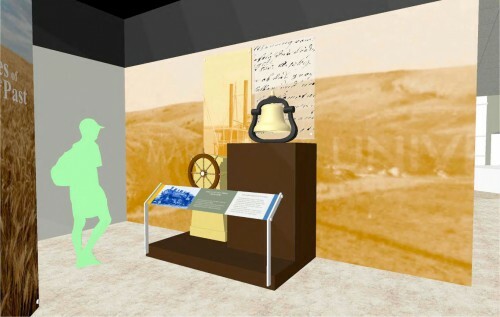 These documents will be further highlighted by such objects as a plow used to break the sod in Dakota Territory, the steering wheel from a steamboat that plied the upper Missouri River, and a bell from a locomotive engine that pulled cars laden with grain and passengers across the Dakota plains. Additional features of the exhibit redesign will allow CWS to place on display some of the remarkable examples of quill- and beadwork from the Blue Cloud Abbey — American Indian Culture Research Center Collection. The exhibits will also introduce visitors to authors O.E. Rolvaag, Herbert Krause, and Frederick Manfred, whose lives are intertwined with CWS and whose writings help define the Northern Plains region. 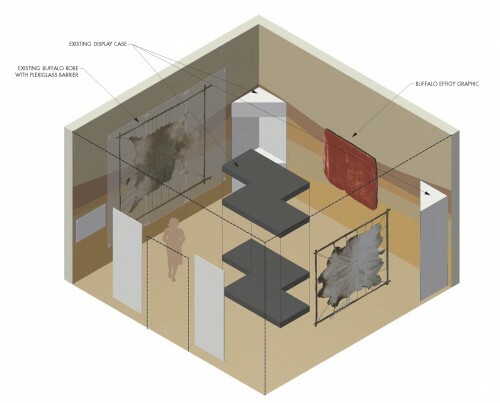 The images presented here are conceptual drawings for the Fantle and Froiland Plains Indian Galleries. With gifts in hand approaching $200,000 and completion of the concept design phase, CWS is proceeding with the next phase of the Exhibit Expansion Initiative—design development. This phase has several stages—design development I & II, pre-production, production, and installation. The initiative will significantly impact three museum exhibit areas and will require considerable staff involvement throughout the forthcoming twelve-month period. Follow the progress of the Fantle Gallery portion of the project on the CWS Facebook page. The Center gratefully recognizes the following for their financial support of the Exhibit Expansion Initiative: Lynn and Barbara Aspaas, L.M. Baylor, Shon Cronk, Verna Berg Estate, Gary and Kathy Conradi, Virginia Dettman Charitable Foundation/SFACF, Ruth Dunmire (in memory of Ray Dunmire), Elizabeth Gutch, Howard and Eunice Hovland, Gil and Lillian Johnsson, Gerry and Robert Law, Gordon (’57-59) and Joan (’59) Nelson Family, Ronald R. Nelson Trust, Larry Ness, Gary and Roseann Olson, Richard and Tammy Otten (in honor of Lynn and Barbara Aspaas), Lynwood Oyos, Darwin and Jane Sletten, Charline Smith, and attendees of the June Event in 2013 and 2014. If you would like to make a gift to the exhibit initiative, please contact Executive Director Harry Thompson.